It is recommended that the antibody be carefully titrated for optimal performance in the assay of interest. Excitation: 488 nm; Emission: 520 nm; Laser: Blue Laser. Filtration: 0.2 μm post-manufacturing filtered. FR4 is a heavily glycosylated 35 kD receptor for folic acid and the physiologic circulating form of the vitamin, N5-methyltetrahydrofolate. 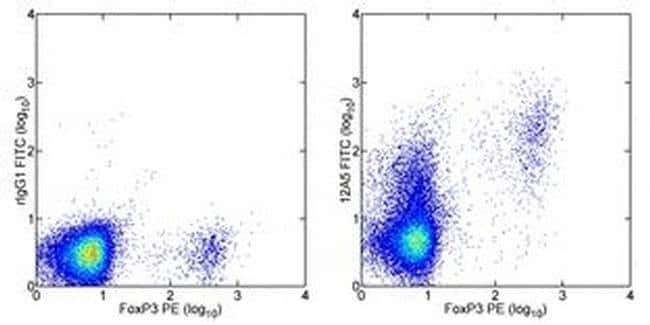 Natural T regs have high levels of FR4 and together with CD25 can be used to distinguish natural Tregs, effector T cells, memory-like T cells and naive T cells. In vivo studies with eBioTH6 show a decrease in the number of CD4+CD25+ cells and an enhanced tumor response leading to the elimination of advanced stages of tumors.